Chris Brind: “In Bed with Vaadin and OSGi“. I use Chris’ bundles in my demo. In the next weeks I plan to go a little bit more into details of the demo, how OSGi declarative services are used, how to contribute to Vaadin Themes, etc. Nice Demo. Had to change jetty port on my windows box. Thanks Thomas, I updated the post saying how to change the default Jetty port. Sounds promising. How are things like ServletContext shared by all these bundles which the web app is comprised of? What can I actually seggregate? In GlassFish, we support fragmentation of web apps, but there the fragments (web-fragments) are delivered as OSGi bundle fragments, so we don’t support dynamic as in runtime dynamism, but we at least allow the entire web app to be customized without touching the core web app. Typical Vaadin applications don’t directly access the servlet API classes. State, where required, is stored in the Application object which is created by the framework on a per-session basis. I believe that Kai’s extensions allow contributing bundles visibility of the Application — they would need this in order to add their UI contributions to it. This is obviously a framework-specific ability. Vaadin happens to work very well in a dynamic modular environment. I don’t think you can solve the general problem of dynamic contributions in all web frameworks (if that’s what you’re trying to achieve in Glassfish). Actually the bundles contributing to the UI do not have to know the Vaadin application. In the demo, the main application takes care of adding/removing Vaadin components contributed by other bundles to/from the root component tree. I just pass the application into the service interfaces so that the contributing bundles could use the application API (like setting the theme). As Neil pointed out, the Vaadin bundles do not use the servlet API directly, they use only Vaadin APIs. What I really like is the possibility to dynamically add UI components to the applications root UI tree at runtime. One advantage of this approach is that you could exchange (or update) bundles at runtime without shutting down the entire application. I don’t think this would be possible with other server-side UI technologies like JSF. The disadvantage of using fragments would be that they cannot activated/stopped separately from their hosts. In the demo, I use Chris Brind’s resource binding, so all resource contributions like icons have to be a fragment of the main Vaadin bundle. This is kind of disadvantage but I don’t know of a better solution right now. Great job!!! Thanks!!! I’ve benn looking for such demo several month… I am a big fan of Vaadin and OSGi too, and tried to make them work together on a naked osgi framework (not in glassfish or spring or other huge environment). I made some quirky bundles, and they are even work! but your solution is more elegant and convenient. Thanks again! Started working this, and it’s fantastic. About the only thing I would add, is have you tried with Virgo (ie, Spring-DM) yet? Being able to access the Spring Security service here would be absolutely awesome. I’m also very interested to know this! I did some little experiments and modifications with this example for using on Eclipse Virgo. It is just a part of this example (3 modules only) , but it can help you. Any idea of how getting images from a bundle and display it in another bundle, in a Vaadin/OSGi application (without changing theme) ? Great job, thanks a lot. I have seen the session on the JAX this year. At the moment I think about, how to integrate internationalization. Have you a hint for me?? 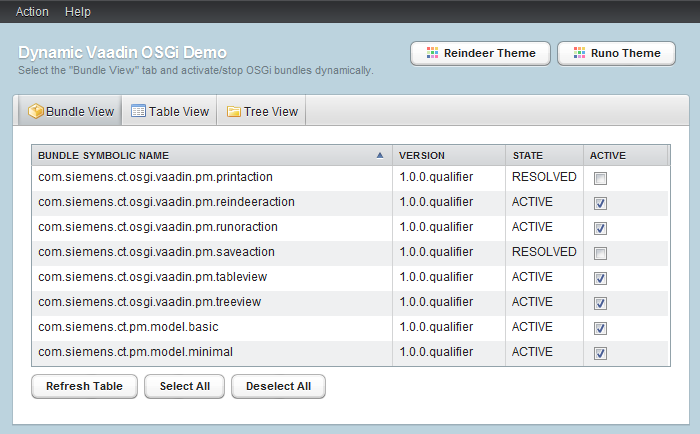 I have been successfully running my Vaadin+OSGi app on GlassFish 3.1. What problems have you encountered. One thing that I stumbled across was the missing bundle for the declarative services. But after adding that everything worked just fine. would it be possible to run your app in a Tomcat container? Would it be possible to reuse the component returned by for example the TableView bundle in multiple instances across the MainApplication? My idea is to create something like reuseable ui components provided through osgi bundles. For example open multiple windows showing the same component to edit a persons properties (name, company, ..) parameterized with different person ids. IMHO this is equivalent to the Actions / TabItems provided in the demo. You register a service, not a service factory so you always get the same instance, which implements your UI component. By retrieving the service you get you reusable UI component. However you have to be careful with multiple thread-access. thanks for the great demo. I’ve also checked the com.siemens.ct.osgi.vaadin.pm.theme fragment to understand resource handling, but one question remained. c) deploy the widgetset to the Host Service? Do I have to create a separate project where I have to include the Add-Ons, themes, etc. compile the widgetset and copy the result to a fragment bundle? What has to be exported by this fragment? Unfortunately all of my trials failed and I was not even able to add a new theme (chameleon) via a fragment bundle. When I use multiple browsers to access the application, and each browser page refresh frequently, components not displayed correctly. Of course you could start and stop bundles from the OSGi console directly, then you would have to refresh the browser to get the changes displayed. Is there any way to remedy this? I.e. can the vaadin remove the “stopped” bundles from the list automatically? What does “pm” in the “com.siemens.ct.pm…” stand for? Something has caused us to be out of sync with the server. Take note of any unsaved data, and click here to re-sync. Hi Ki, I really like your demo. I’m trying to convert it to Vaadin7 but I have some problems because the osgi addon is not availble (I suspect). Do you have any suggestions? Right now I have no suggestions. 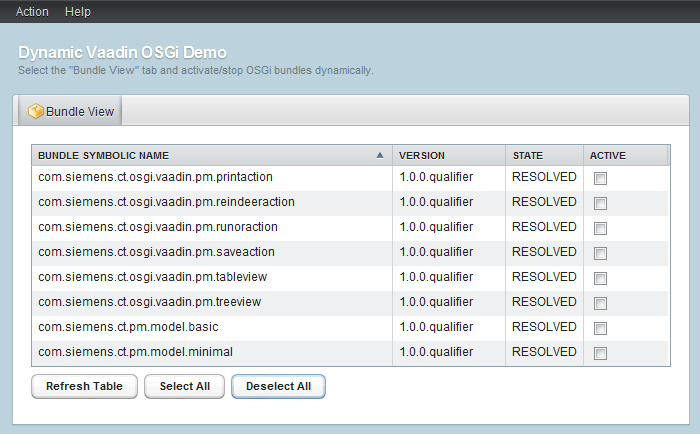 But probably I will try to port the osgi addon to Vaadin 7.
your demo is really interesting. but if I wanted to deploy your demo on servicemix (karaf container) what changes should I make to the projects? Now, is possible make this with apache tomcat? how? Each modules need to be a war (Java web project) or can be a jar (Simple java project) and throw it on WEB-INF/lib of the main web app? is this still working with Vaadin 8? Do you have any experience with Vaadin 8 and OSGI? I have no experience with Vaadin 8 and OSGi. Since the demo is pretty old, I don’t expect it to be working with Vaadin 8.